California State Military Museum. Fair use may apply. 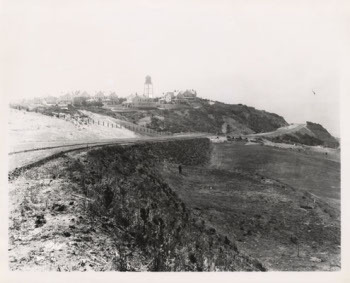 Fort Miley (122.506W 37.782N) was located on the south side of the Golden Gate west of San Francisco. The Army acquired some 54 acres (22 hectares) of land here in 1891 but did little with the site until 1899. By the time war broke out in the Pacific, the fort had three 12" (305 mm) guns and no less than 16 12"mortars, though of ancient vintage, and five obsolescent 3" (76 mm) antiaircraft guns. Two 6" (152mm) guns were added in 1942. The 12" guns and mortars were all removed in 1943 and replaced with mounts for two more 6" guns (which were not actually installed), four 90mm guns, and two 40mm antiaircraft guns. The fort was also the site of a large Veteran's Hospital.